The great messaging app which Facebook bought for $19bn is now down after few days. Whatsapp is down for about past half an hour. No users are able to send or receive messages due to the connection failure. 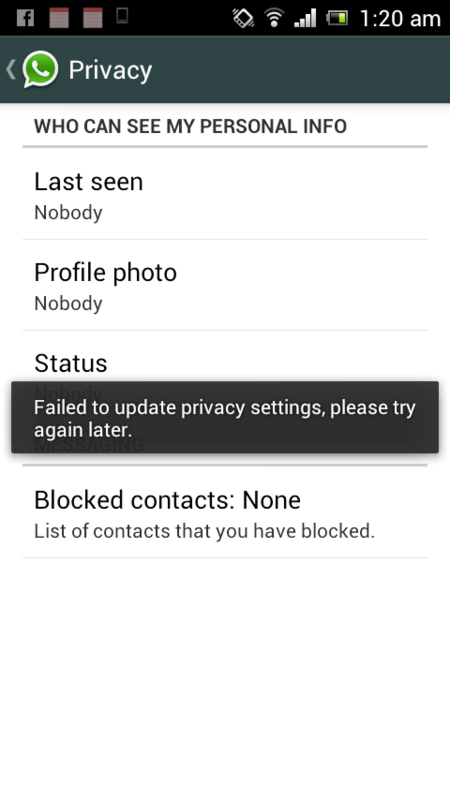 It just keep showing that whatsapp failed to connect, please try again, when i tried to change privacy settings. According to BGR India, they have confirmed the news that whatsapp is facing some connection issues right now. We still have no news that how much time it would take to restore the service. Is this what we expect from Facebook, after recently purchasing the company for a whooping $19bn. Without whatsapp it just feel that we are disconnected from the outside world. Are you facing the same issues?? What are your views on this, let us know through the comment section below.